This week marks the launch of a new 3-year practical theological education program for pastors in Capiz province. 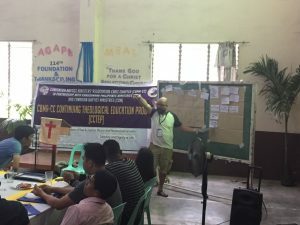 Capiz Continuing Theological Education Program, known as CCTEP, will involve over 30 pastors from all regions of Capiz province. Over the three years, each participant will complete a total of 18 courses (6 per year), with topics covering a wide range of practical theological topics related to pastoral ministry in their respective context. This program was developed as a result of the expressed need of pastors throughout Capiz province for this kind of practical theological education. 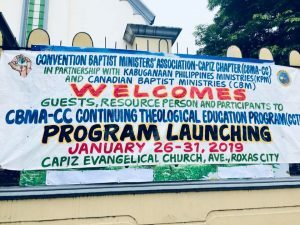 Through the partnership of Canadian Baptist Ministries (CBM) and Kabuganaan Philippines Ministries (KPM), and with the assistance of a dedicate team of young pastors, CCTEP was developed in partnership with the Convention Baptist Ministers Association – Capiz Chapter (CBMA-CC). 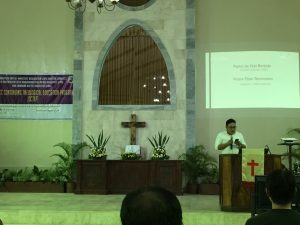 Pastor Jec Dan Borlado, who serves as one of the Directors at the Convention of Philippine Baptist Churches (CPBC), bringing greetings and words of support on behalf of Rev. Dr. Jerson Narciso (General Secretary of CPBC). We are thrilled that our colleague, Emo Yango, is able to be with us this week in Roxas City. Emo was instrumental during the conceptualization of CCTEP and he provided a lot of guidance to the CCTEP organizing team throughout the program design, and as they prepared course outlines and descriptions. This week Emo is serving as the facilitator for the first two courses in the CCTEP program. Emo is a brilliant theologian/missiologist and an experienced educator, and as a Filipino, he understands very well the real situation of pastors in Capiz province. This week he is facilitating courses on ‘Salvation and the Kingdom of God’ and ‘Justice, Peace, and Reconciliation’. The goal of these courses, of course, is that each participant will gain new practical and useful knowledge that they will be able to apply to their respective church and community context immediately (not at the end of the 3 year program). Emo leading the participants through a learning activity designed to get them thinking about the Kingdom of God. Participating in a program like this is not easy for pastors. It requires a significant commitment of time, and pulls them away from their churches and families for several days at a time. We invite you to join us in praying for each pastor who is participating in CCTEP. Please pray that it would be a positive experience of learning that would strengthen their pastoral ministries and ultimately strengthen each local church in spreading the Gospel of Jesus Christ through word and deed.